This DIY nursery came together over the past several months, due to lots of hard work from me, my mom and my husband. I couldn't be more pleased. If only my photos could really do it justice. I found the hot air balloon mobile on Amazon and was immediately sold. That was the inspiration for baby girls room. 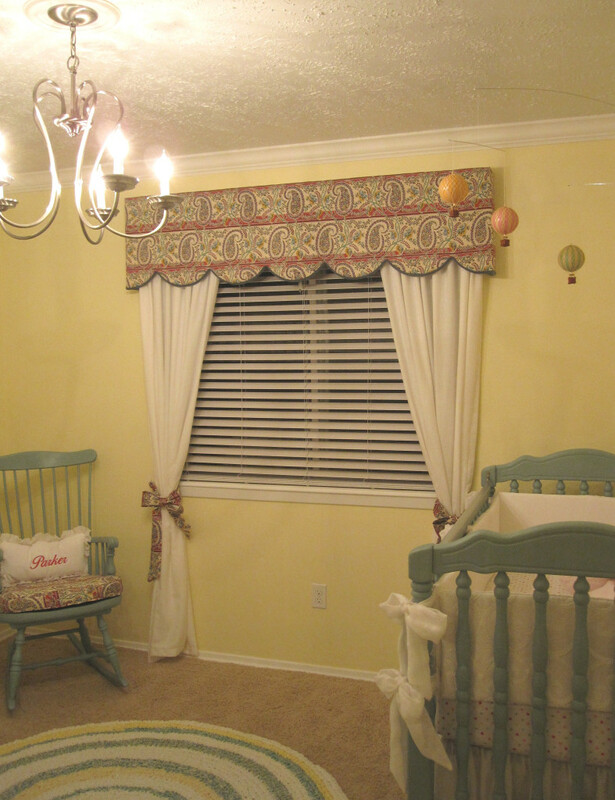 DIY: All crib bedding, closet panels, rag rug, rocker cushion, pillow, valance & panels, & changing pad cover. I have a lot of favorites when it comes to this room. It is really hard to choose just one. I love the ambiance when you walk in and look around. There has been so much work and effort put into almost everything in the room, from the crib, to the rocker, to the bedding, to the window & closet treatments, to the rug...I really can't pick just one. If you're planning to DIY, be prepared for a lot of hard work and determination. I started with painting the crib, dresser and rocker in March. I was fortunate to already have the dresser, and with a little paint...made it work with my nursery theme. Also pretty neat, the crib was mine from when I was a baby...my mom was able to convince my dad to keep it for that long! I fell in love with the rocking chair I found on Craigslist. I didn't want one of the big bulky rockers you find in the store...the room just isn't big enough. As far as chalk paint goes, if I were to do it over again, I would probably try one of the make your own chalk paint recipes you can find online. The paint & wax I used seemed to be expensive. Once those were finished, I was able to move on to the bedding & other small details. Originally, I was planning on doing all white fabric for the bedding and window treatment, but while I was fabric shopping I came across the valance fabric & just fell in love. I debated about it for quite a while, but I'm glad I stuck with my instinct and went with the colorful fabric. I think it helps the room a lot. I looked and looked for a rug that I felt had the "shabby chic" look to it, and came across these rag rugs on ETSY. My incredible mom made the one I have in the nursery, it's about 5.5 ft. If you are looking for a rag rug, really shop them on ETSY, the prices range A LOT. And if you are planning on make one, be sure you really shop your fabric. They can become very expensive if you do not get good prices on the fabric. That rug used close to 40 yards. I was also able to find very good prices on the panel fabric for both the window and closet, as well as the bed skirt. I was also really lucky, my mom works for a design center, so we were able to get the light fixture for about $80. I'm not much of a shopper, but I really became one for this room, because I didn't want to spend more money than I needed to. I was also able to use gift cards to Target (from the shower) to purchase her fan and mirror.